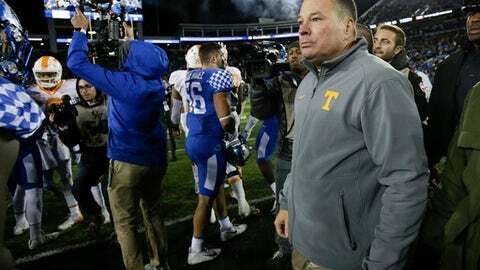 KNOXVILLE, Tenn. (AP) Tennessee coach Butch Jones says he’s ”disappointed but not discouraged” and believes he still has the support of athletic director John Currie as the Volunteers try to snap a four-game skid. The Vols (3-5) head into their Saturday homecoming game with Southern Mississippi (5-3) trying to avoid their first five-game losing streak since 1988, when they dropped their first six games before rallying to finish 5-6. Jones, who has a 33-26 record in five seasons, is making $4.1 million annually with a contract that runs through Feb. 28, 2021. According to terms of his buyout, Tennessee would owe him more than $8 million if it fired him now without cause, though that figure depends on Jones making ”reasonable and diligent efforts” to get a comparable job and could be mitigated if he does land another position. Jones said Saturday after a 29-26 loss to Kentucky that he ”absolutely” felt he still had Currie’s support. Jones said Monday that ”nothing has changed at all” in that regard and that he and the athletic director talk every day. ”He’s a great person to work for,” Jones said. After opening the season in the AP Top 25 , the Vols are winless in SEC competition. It’s a major step backward for a program that had won bowl games under Jones each of the last three seasons . The Vols’ loss to Kentucky marked just the second time they had fallen to the Wildcats in their last 33 meetings. Tennessee’s skid also includes a 41-0 defeat to Georgia that represented the Vols’ most lopsided home loss since 1905. Tennessee’s offense had gone 15 straight quarters without a touchdown before reaching the end zone twice against Kentucky. Jarrett Guarantano has been sacked 18 times in three starts. Three times this season, the Vols have committed a false start from the opponent’s 1-yard line, and they didn’t score touchdowns on any of those drives. Tennessee lost to Kentucky despite having a plus-four turnover margin. The slump has taken a toll on a fan base eager for change, particularly now that SEC East rival Florida has made a move by parting ways with Jim McElwain . Albert Haynesworth, a former Tennessee and All-Pro defensive lineman, tweeted it was ”Unbelievable gators fire their coach but we still got (to) deal with Botched Jones!! !” The hashtag ”EmptyNeyland” has circulated on Twitter among disgruntled fans believing they can hasten Jones’ departure by skipping home games. Wide receiver Brandon Johnson said the team’s ”top priority” now is to earn a bowl bid. The players are trying not to get distracted by all the speculation surrounding the coaching staff’s future. Jones’ assistants are taking the same approach. NOTES: Jones said leading rusher John Kelly and backup linebacker Will Ignont would return to practice Monday and that ”whether they’ll be available for the (Southern Mississippi) game or not, that’s on them.” Kelly and Ignont were suspended for the Kentucky game after being cited last week on misdemeanor marijuana-related charges. … Jones said wide receiver Josh Smith won’t play against Southern Mississippi because of an ankle injury. Jones considers injured offensive tackle Marcus Tatum doubtful for Saturday’s game. Tatum didn’t play against Kentucky.